William Mumler was a Boston jeweler whose life swerved in a peculiar direction in the 1860s when he became obsessed with the emerging art of photography. Soon he was spending all his spare time and money on dark room equipment, camera accessories, stacks of glass plates, toxic chemicals and all the other paraphernalia associated with his new passion. One dreary evening he was hard at work developing a self-portrait. Although he had been alone while shooting the picture, it contained a blurry second figure. Closer examination revealed it was nothing more than a simple double exposure. However, as he stared at the botched image, Mumler realized the phantom figure looked exactly like his cousin who had been dead for years. Within days, he had abandoned the jewelry business and reinvented himself as the world’s first Professional Spirit Photographer. His timing was exquisite. Americans were reeling from the unmitigated disaster of the Civil War. The exact number of casualties is unknown, but estimates run as high as 600,000 dead. Very few families were untouched by the tragedy. Despite the atmosphere of shock and grief, progress was the watchword of the day. Each day brought news reports of major technological breakthroughs and amazing scientific discoveries. It seemed humanity was on the verge of solving all the world’s problems. Perhaps even Mother Nature was about to reveal her deepest secrets. No device was more mesmerizing, mysterious and unsettling than the camera. It “saw” details invisible to the naked eye. Some began to wonder if the magic box could photograph people’s thoughts or whether a camera could capture the fleeting images of dreams. Could cameras peer into the future? What about the past? Enter William Mumler. He offered photographic sessions that were also séances. He claimed that his sensitivity, ability to communicate with the dead and skill with the camera enabled him to capture images of the dearly departed. He was immediately inundated by grieving customers anxious to pay his high fees. As word of Mumler’s amazing talents spread, the depressed, distraught and simply curious flocked to his studio. Soon other photographers began to produce their own versions of spirit photos. The techniques for creating the images were fairly simple. The photographer could modify the glass plate before the picture was taken or alter the negative during developing. There was even a clever device called a ghost stamp that added otherworldly effects. Small enough to conceal in a pocket, it was a hollow tube into which a glass slide containing the image of a face was inserted. The photographer pressed one end of the ghost stamp against the negative then shone a bright light through the other end of the tube. Just like magic, a small round face appeared in the shot. It was also possible to add an apparition without altering the negative or interfering with the developing process at all. Taking a picture with early cameras was a long, drawn out process. The shutter had to stay open for several minutes while the subject sat perfectly still. There was plenty of time for the photographer’s assistant draped in gauzy white fabric to tiptoe into the studio, strike a dramatic pose behind the subject and remain in place a few seconds before quietly slipping away undetected. This created a mysterious, transparent figure in the background of an otherwise crystal clear shot. 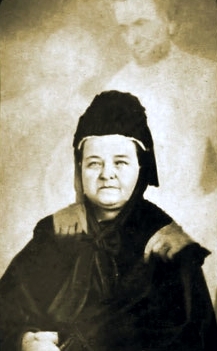 In 1869 Abraham Lincoln’s deeply depressed and notoriously unstable widow Mary booked a photo session with Mumler under an assumed name. The photographer swore he did not recognize her. The picture he took of Mrs. Lincoln was nothing short of astounding. The amazing Lincoln photo made the rounds transforming Mumler into a celebrity. However, as his fame spread and more people saw his pictures, a few of them had the unnerving experience of recognizing their own faces on the ghostly forms flitting though the shots. William Mumler had cannibalized photos of the living to create his portraits of the dead. He was arrested and charged with fraud. Describing a sensational court proceeding as a circus has become clichéd, but the term was still fresh when Mumler’s trial began. The fact that P.T. Barnum, the King of the Big Top, who was himself a blatant scam artist, appeared in court and accused Mumler of preying on the vulnerable added to the spectacle. Incredibly, the prosecution was unable to prove that the photographs had been faked and although Mumler was acquitted, his reputation was in tatters and his photographic career was over. Spirit photos are usually associated with the Victorian era, although a segment of the population continued to believe in and pay for them for several more decades. The phenomenon finally faded into obscurity in the 1930s. When we look at antique spirit photographs today, it’s hard to believe anyone ever thought they were real. Deep grief and the desire to see a deceased loved one’s face are powerful motivators and the photos were produced before people understood how easy it was to alter the images. In any case, then as now, the camera doesn’t lie. It’s the person behind the lens we must be wary of.